The many cases of corruption that have come to light, among other scandals, have led the public to lose faith in the management of public institutions. In order to regain confidence, the government needs to inform its citizens of all its actions. Public information should be accessible and controlled by means of a regulatory framework. The aim of this chapter is to analyze the transparency achieved and the progress still needed to be made by Dominican Republic municipalities with regards to complying with the requirements of the law on public information management. The chapter discusses the voluntary transparency achieved and factors that affect the implementation of information policies. The results highlight deficiencies in certain areas of online public information disclosure. The population size, economic capacity and electoral turnout are all factors that affect the online dissemination of public information by local governments in the Dominican Republic. Public administrations and policymakers manage resources obtained from the population. As these resources are limited and always insufficient to meet the main goal of the public sector, that of satisfying the general interest, it is important for citizens to be assured that resources are managed efficiently. Public confidence in this respect depends largely on the information and explanations that public administrations provide regarding their actions (Kenneth, 2007). However, the public’s confidence in its institutions has been eroded by various factors, including administrative corruption, socio-cultural change and ineffective public policies (Nye et al., 1997), political scandals, the economic slowdown and the financial crisis (Moon, 2002a) and the deterioration of the democratic system (Estévez, 2005). 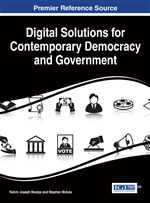 Many authors argue that the fundamental mechanism to enhance the democratic legitimacy of our institutions and to ensure that citizens do not lose faith and confidence in government is that of greater information disclosure and transparency by the public sector. Thus, Bertot et al. (2010) state that transparency and the right of access to public information are internationally considered essential mechanisms to promote democratic participation, to maintain confidence in the government and to prevent corruption. This is corroborated by López and Arellano (2008) who identify a relationship between these mechanisms by which the focal point for achieving greater transparency, and thus improved accountability and higher-quality governance is access to public information. Therefore, the key to enhancing transparency in the public sector is greater access to public information. This calls for a framework for regulating information disclosure, the right to obtain information from public organisations and mechanisms to enable the exercise of this right (Spahiu, 2012). In line with this idea, the use of information and communication technologies (ICTs) could facilitate the disclosure of public information (West, 2004), helping to increase its availability and providing access to all citizens. Internet facilitates communication, at low cost, between the public sector and society (Musso et al., 2000; West, 2004). Therefore, the Internet could constitute a mechanism by which the right of access to public information could effectively be exercised. In this context, several countries in Latin America, characterised by scant development and high levels of corruption, have adopted new laws on access to public information. This legislation highlights the commitment of these states to information transparency, by making online information disclosure mandatory. In 2004, the Dominican Republic, a developing country that shares this commitment, adopted a new law on transparency and access to public information to ensure that everybody has the right to request and obtain effective, accurate and timely information regarding acts and activities carried out by public bodies. However, despite the importance of such transparency and the benefits it offers, research suggests that public organisations do not always comply with obligations concerning the right of access to public information. Several theories have been advanced to explain the disclosure of information by public administrations, including legitimacy theory (Dowling & Pfeffer, 1975), institutional theory (DiMaggio & Powell, 1983), agency theory (Jensen & Meckling, 1976) and stakeholder theory (Freeman, 1984). Among these theories, different ideas are proposed as to how the political, social, economic or institutional circumstances of government may affect its policy of transparency as a means of acquiring legitimacy and of enhancing democracy. Taking into account these circumstances, we wish to determine which factors may influence information disclosure by local governments.